Data released May 26 by the EIA shows that March 2016 was a historically low month for coal generation in the United States. National coal generation dropped to just 72 TWh, the lowest level of monthly coal generation measured since April 1978 (see Figure 1). While before 2015 it was uncommon for natural gas generation to approach equivalent levels of coal generation, in March 2016 nearly 1.5 times as much electricity was produced from natural gas-fired generators as coal-fired generators. The spring is typically a low period for all types of electric generation, as this is when many plants go offline for scheduled maintenance. March 2016 in particular featured lower-than-normal electric generation from many resources. However, the level of coal generation experienced in March 2016 was 30 to 50 percent lower than has been typical for March. Coal generation in March 2016 approached levels nearly one-third of the highest-ever month for coal generation, a record set back in August 2007. The trend of decreasing coal generation can be attributed to both falling natural gas prices and stagnant demand for electricity, but it can also be partially attributed to the increasing role of solar and wind generation: March 2016 set records for both the highest amount of monthly wind generation ever measured and the highest amount of monthly utility-scale solar generation ever measured. With solar generation setting record highs that month, it is likely that the months of April, May, June, July, and August will be record-setting months for solar generation, as well. 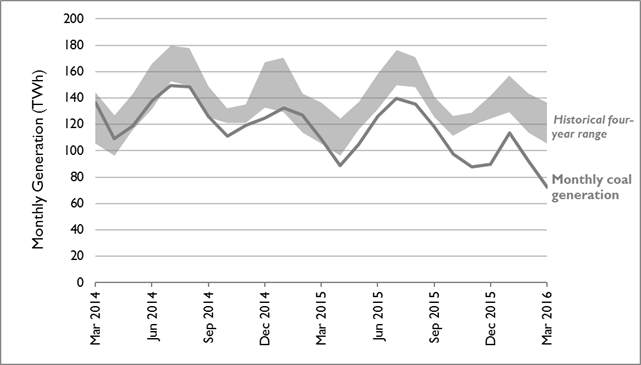 The above figure compares monthly generation from coal (gray line) against a rolling range of generation from the previous four years. March 2016, for example, compares generation in March 2016 against the range of generation across March 2012, 2013, 2014, and 2015.